Shout Out to Coach Maurice! Over the past school year, the Grade 2 class has been using their collective passion for the Winnipeg Jets to learn about staying on TRACK and building stamina in their work as dedicated students. Just as the Winnipeg Jets work hard on and off the ice to build stamina as athletes, the Grade 2’s have been working hard in and out of the classroom to build stamina as successful students. Word of the students passion and dedication throughout the school year reached the ears of some very special individuals. Monsignor Comeault, Pastor of Our Lady of Perpetual Help, and Mr. Paul Maurice, Head Coach of the Winnipeg Jets surprised the Grade 2’s and brought with them a very important message. Coach Maurice shared that over the past hockey season the team focused on building relationships. 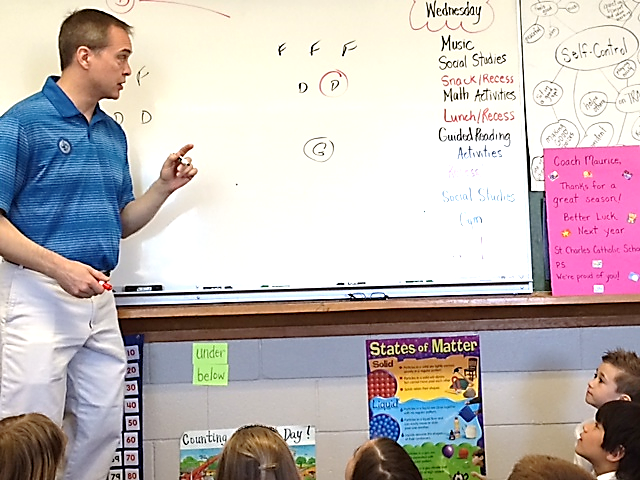 He encouraged the class to think about their classroom as a team and a team is somewhere that everyone belongs. Each person on the team is important and brings something special to it’s success. It’s important to have confidence in yourself even though you may not be the fastest runner or the best reader, you are still important to your team. Coach Maurice encouraged each student to find something that they are good at and use it as a strength to be a leader on the team. The students also had an opportunity to ask Coach Maurice questions. He was asked questions about game play, player trades, his family and how he stays on TRACK. Coach Maurice told the students that he stays on TRACK by relying on the people around him like his family and Monsignor Comeault. Yes, he can sometimes get off TRACK by making mistakes but it’s important to learn from them and to have good people around to help you get better. Upon reflecting on the exciting visit, the students were surprised by the fact that the Winnipeg Jets were working on many of the same things they have been working on this year. They were amazed that even NHL coaches and athletes need to work at staying focused by making good choices, just as they have been focusing on throughout the year. 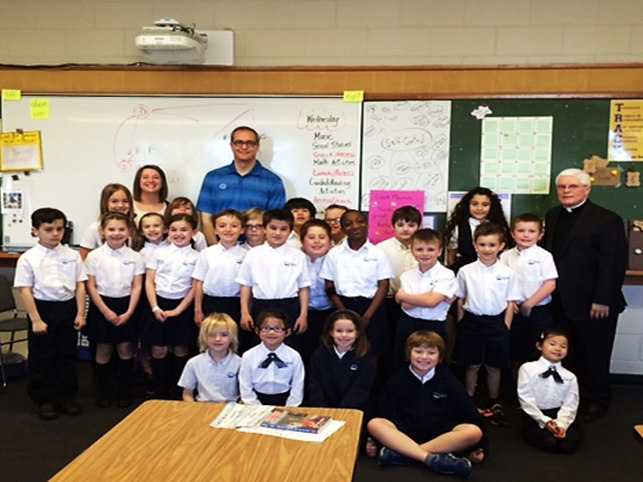 The Grade 2’s would like to give a special shout out to Monsignor Comeault and Coach Maurice for the visit. They are grateful for the words of wisdom and the inspiring message that was shared. What a special honor!